Metso Santa Ana de Bolueta Grinding Media SA, located in Vizcaya, Spain, has been awarded by the Basque Government for its contribution to the mining industry and economic development of the local community. 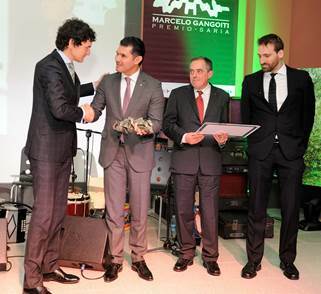 The annual Marcelo Gangoiti Prize is presented to a company that has excelled in the promotion of growth and development of the steel industry and products directed to the mining sector. "We are proud and humble to receive this award. For us, it has been imperative to continuously innovate and adapt to access new markets and grow. Our close ties with the local steel producers and nearby communities were also considered to play a key role when the award winner was selected" explains Felix Fornaguera, Vice President, Grinding Wears, Metso. Metso's grinding media knowledge and manufacturing capabilities are built on over 40 years of experience. Today, Metso offers a unique combination of premium media and mill linings combined with an unmatched expertise of the grinding process and optimization services to help make the process more efficient and to reduce the total cost of operation.